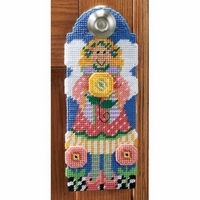 Angel Door Knob Hanger Plastic Canvas Kit. Make this precious angel door knob holder for any room in your house. This is stitched on 7 count plastic canvas and is rated easy making it a great kit for beginners. Comes with everything needed to make one door knob hanger. Finished size is 5 1/2" x 13 1/2"